Recent scientific and technical advances, as well as the ingenuity of the Nonlinear Photonics team , set the stage for this spectacular demonstration (a research line initiated by Matteo Clerici when he was a Post-doctoral Fellow in the team), where an electric charge follows a smooth path along a straight or parabolic trajectory. 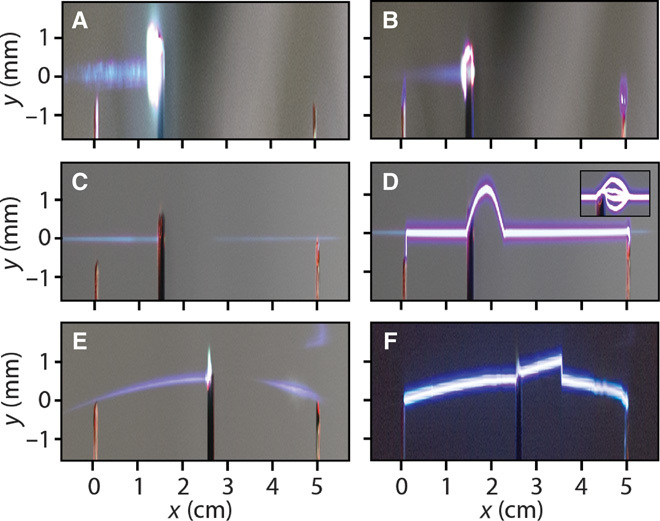 Fig 1: (A), (C), and (E) show how the intense part of the beam (the blue fluorescence in the photographs) is modified upon the insertion of an object in the beam path for a Gaussian, a Bessel, and an Airy beam, respectively. In the Gaussian case, the intensity of the beam is completely quenched after the obstacle and there is no way to guide an electric discharge between the two poles shown in (B). (D and F) In contrast, for both the cases of a Bessel-type and of an Airy-type propagation, the beam restores itself after the obstacle and the electric discharge occurs along an almost unaffected trajectory. The inset in (D) shows a multishot acquisition where the discharge in the region right after the obstacle chooses different paths for different shots, before converging to a straight trajectory when self-healing takes place. We performed experiments where an obstacle is placed directly in the beam path so that it completely blocks the main intensity peak of the laser pulse. For the case of a standard Gaussian beam, this results in a complete quenching of the beam, and no light is transmitted. As shown in Fig. 1A, the conductive channel is also obstructed, and no discharge occurs when the potential is applied between the two electrodes (Fig. 1B). The situation is completely different in the case of nondiffracting laser beams. Indeed, for such waveforms, it has been demonstrated that even if the main intensity peak is blocked while the remaining part of the beam is allowed to pass, self-healing takes place [7–9] and the intense part of the beam reconstructs itself after encountering an obstacle. This can be clearly seen in Fig. 1 (C and E), where the plasma fluorescence generated by a Bessel and an Airy beam, respectively, reappears after few millimeters, beyond an opaque screen that is placed in the beam path. As a consequence, we observe that the electric discharge channel can also self-heal so that it may propagate between the two electrodes (see Fig. 1, D and F). We note that in the region immediately after the obstacle, where the laser beam has not healed yet and is thus not able to substantially ionize the medium, the electric path is actually random from one laser shot to the next (see inset in Fig. 1D). However, it is the presence of the healed plasma channel after the obstacle that ensures that the discharge actually occurs and follows a well-defined path along the optical beam trajectory. K. H. Ho, S. T. Newman, “State of the art electrical discharge machining (EDM)”, International Journal of Machine Tools and Manufacture 43 , 1287–1300 (2003). A. Calka, D. Wexler, “Mechanical milling assisted by electrical discharge”, Nature 419 ,147–151 (2002). D. Dale, M. D. Checkel, P. R. Smy, “Application of high energy ignition systems to engines”, Progress in Energy and Combustion Science 23, 379–398 (1997). W. Kim, H. Do, M. G. Mungal, M. A. Cappelli, “Plasma-discharge stabilization of jet diffusion flames”, IEEE Transactions on Plasma Science 34, 2545–2551 (2006). J. R. Roth, “Aerodynamic flow acceleration using paraelectric and peristaltic electrohydrodynamic effects of a one atmosphere uniform glow discharge plasma”, Physics of Plasmas 10, 2117 (2003). R. P. MacDonald, S. A. Boothroyd, T. Okamoto, J. Chrostowski, B. A. Syrett, “Interboard optical data distribution by Bessel beam shadowing”, Optics Communications, 122, 169–177 (1996). Z. Bouchal, J. Wagner, M. Chlup, “Self-reconstruction of a distorted nondiffracting beam”, Optics Communications 151, 207–211 (1998). J. Broky, G. a Siviloglou, A. Dogariu, D. N. “Christodoulides, Self-healing properties of optical Airy beams”, Optics Express 16, 12880–12891 (2008).